Awesomely located property with a warm host who was waiting for us and she patiently explained the usage of various gadgets and locks in the apartment. 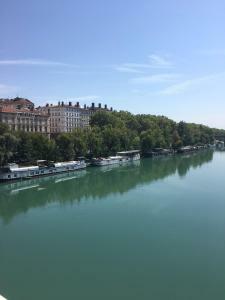 Very conveniently located near to all attractions of Lyon. Spacious flat that was very comfortable for a family of four adults. 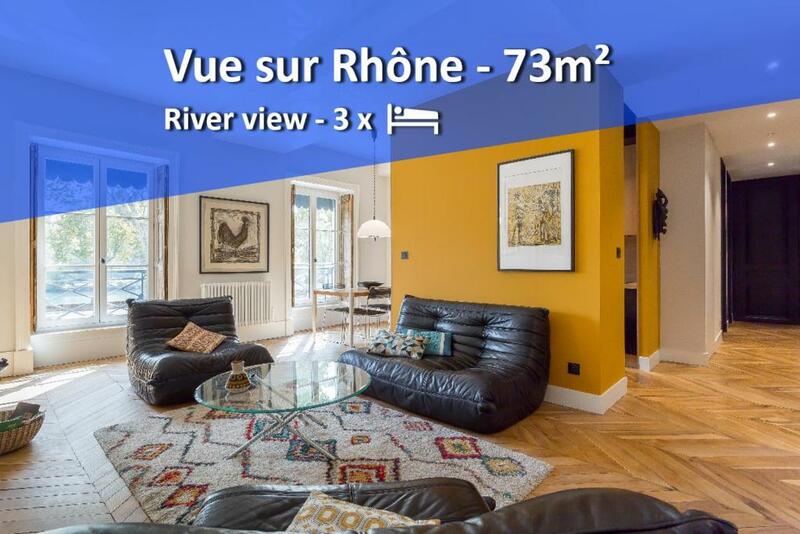 A really lovely flat in a great location, beautiful river view, very comfy beds. Location was perfect for exploring Lyon. Great view of the river. Comfortable beds, good amenities. Very friendly hostess. Excellent property, positioned in a great part of town with easy walking to all attractions. Beautiful clean property with comfortable beds, highly recommended. 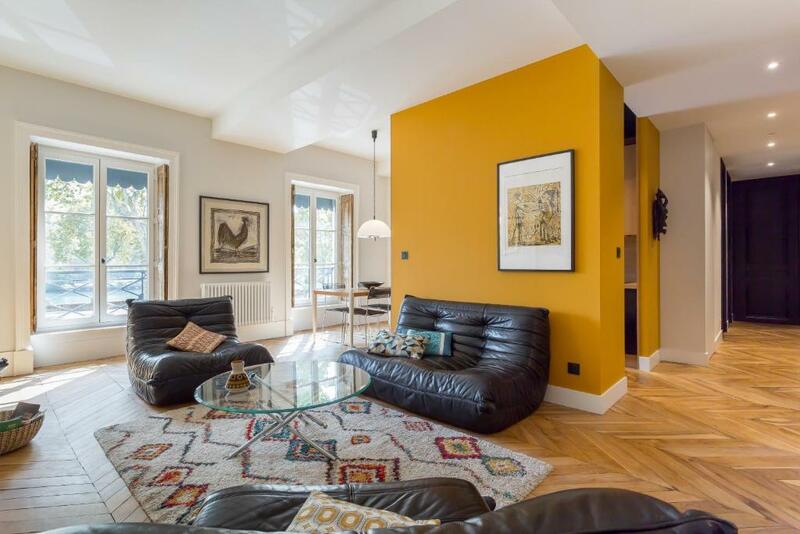 A beautiful well appointed apartment in a great location. Beautifully presented apartment, overlooking river. Tasteful, super-clean, uncluttered and very kind host. Very well-designed and well-equipped kitchen. Contemporary bathroom with good shower & washing machine. 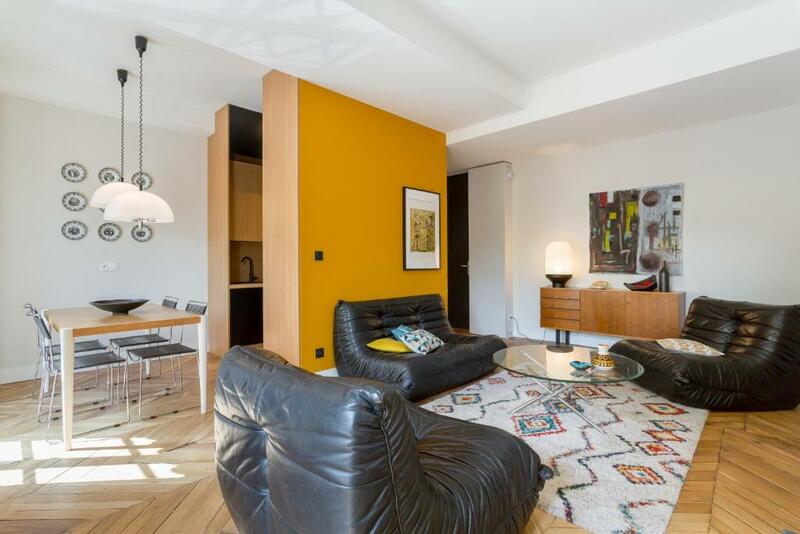 We were looking for some luxury at the end of a 4 week trip, and this apartment ticks all the boxes. The apartment was beautifully decorated, well equipped and clean. The beds were also comfortable. The property was within walking distance to many major attractions. The property also had lovely views of the river and was not far from a local farmers market. The location was very good. Five minutes walk to Hôtel de Ville and short walking distance to the old town. 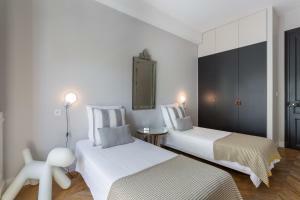 Lock in a great price for Quai-Royale – rated 9.4 by recent guests! One of our top picks in Lyon – and a guest favorite. 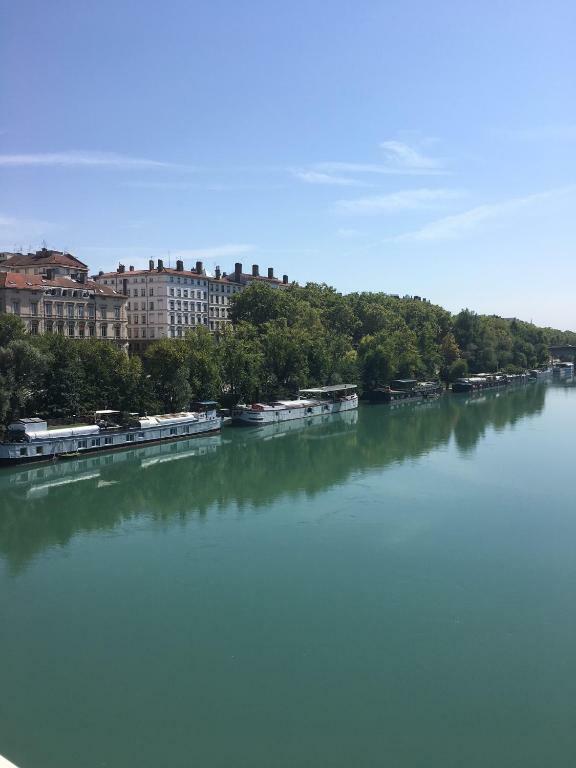 Offering free WiFi and river views, Quai-Royale is a property located in Lyon, just a 15-minute walk from the Museum of Fine Arts of Lyon and 1,800 feet from Opera National de Lyon. 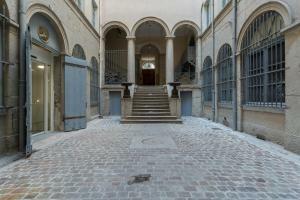 The apartment, housed in a building dating from 18th century, is 1.4 miles from the Musée Miniature et Cinéma. The apartment comes with 2 bedrooms, a kitchen with a dishwasher and a bathroom with a shower. A flat-screen TV is available. Fourviere Roman Theatre is 1.5 miles from the apartment. Saint Exupery Airport is 18 miles from the property. 뀐 Located in the real heart of Lyon, this property has an excellent location score of 9.3! 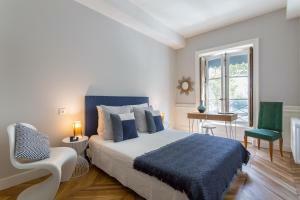 When would you like to stay at Quai-Royale? This apartment has a kitchenware, stovetop and seating area. Sa situation géographique est un atout pour les voyageurs désireux de découvrir Lyon à pied. L'immeuble du 18ème vous éblouira par sa magnificence et sa traboule répertoriée. 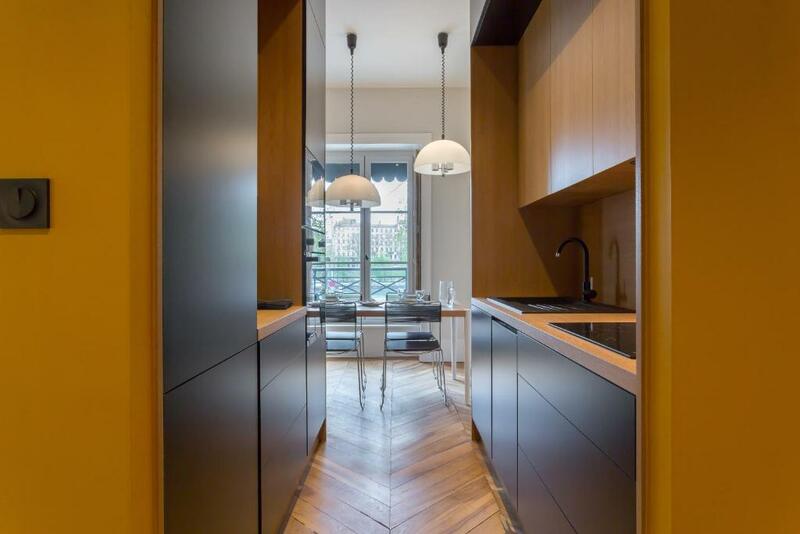 Appartement entièrement refait par une Architecte lyonnaise qui a su exploiter le design et l'authentique de ce bel endroit, plein est, lumineux , chaleureux, design et chic avec vue sur le Rhône et les péniches, sans vis à vis, fonctionnel, d'une superficie idéale pouvant accueillir jusqu'à 4 personnes. Deux grandes chambres avec vue sur le Rhône de plus de 13 m2 chacune avec placard/penderie. A disposition : Nespresso et cafetière,bouilloire, grille pain, presse agrume, sèche cheveux, fer à repasser, lave linge, lave vaisselle. Ventilateurs. Linge de lit et serviettes fournis. A savoir: juillet et août il fait chaud à Lyon. Nous sommes d'anciens collègues de travail, nous aimons les lieux d'exception. Nous vous attendons avec le plus grand plaisir pour vos vacances, votre travail ou un weekend avec des amis, vos enfants ou en amoureux. Nous vous accueillerons en personne à l'heure convenue. A très bientôt. Quartier Opéra -Hotel de ville - place des Terreaux très vivant de jour comme de nuit à proximité des bars, bouchons lyonnais (restaurants typiques lyonnais) des restaurants gastronomiques (rue Royale) qui font de Lyon sa réputation " de capitale de la gastronomie" , musées, salles de spectacles, adresse idéale pour votre shopping et vos soirées nocturnes. A quelques mètres de la station Croix Paquet direction Croix Rousse. Métro ligne A à 200 mètres arrêt Hôtel de ville -Louis Pradel Restaurants semi gastro et gastronomique ru.e Royale. Le parc de la Tête d'Or est à 15 min à pied. 2 parkings : Opéra et Hôtel de ville à 2 min à pied. Depuis la gare de la Part Dieu bus C6 arrêt Pont de Lattre de Tassigny ou métro ligne B direction Charpennes puis ligne A direction Perrache arrêt Hôtel de Ville Louis Pradel rejoindre la place Tolozan et le quai André Lassagne 11. Station Vélo'v place Tolozan à 2min à pied. House Rules Quai-Royale takes special requests – add in the next step! Please inform Quai-Royale of your expected arrival time in advance. You can use the Special Requests box when booking, or contact the property directly using the contact details in your confirmation. Leather furniture in living room not comfy if you’re tall, a bit low;, water drained too slowly out of shower. Noise/smoke seeping in from neighbouring apartments from time to time. There was very often the smell of smoke inside our apartment coming from smokers in adjacent rooms/apartments, especially in the evening and at bedtime. While we understand this to be outside the control of the hosts, it did impact our stay negatively. Due to civic restrictions there is no airconditioning and when experiencing very hot weather ( as we did) to open the windows admits the sound of the N6 which runs past the house. At cooler times this would not be a problem. We stayed in the apartment during the summer and it was very hot inside. The fans simply circulated hot air around and didn't provide much relief. If you opened the windows this would mean it was noisy because the apartment is located near a major road. I think this property would be great in the colder months. Noise from the tabco shop which is located under the apartment. Very clean, nice host, nice facillities (espresso machine, washing machine), very nice view of the river and close to bars and restaurants. Well positioned, great size, beautifully furnished, well stocked with essentials. hałas za oknem , brak zasłonki w kabinie prysznicowej. Duży przestronny apartament z pięknym widokiem na rzekę .Blisko atrakcji turystycznych. Jedynym mankamentem jest ruchliwa ulica pod oknami ale przy zamkniętych oknach nie jest źle . Dwie sypialnie to idealne rozwiazanie dla dorosłych znajomych lub rodziny .